Our principle tool to create this project is permaculture and to describe our objectives we will use the permaculture flower starting with this Land & nature Stewardshipand moving in a clockwise direction. First we will improve the existential casita, office and botanical garden land by creating a nursery, a seed bank, and by propagation of seeds, and starting a compost for regeneration of soil. This will include creation of medical, herbs, and greens gardens, planting of fruits, veggies, and flowers. Next we will obtain a secondary land that needs regeneration, and will regenerate a tropical forest using agroforestry to grow enough food and other services to sustain the project. Later, we will involve investors to help us fund additional property acquisition, or donate other properties to protect and regenerate. In the existential property there is a shelter and office area for volunteers and contributors. We will redesign the shelter using natural and local resources reusing some of the existing materials. In the future lands of the project we will build simple shelters that will use natural and local materials. The existing shelter has water and electricity from local services and a water toilet with a septic tank and a kitchen with a small gas stove. Many of the systems will be improved and redesigned to use solar electricity, a wood burning stove, well water, rain catchment, compost toilet and graywater systems. In future shelters of the project will be improved and redesigned using the principles of reuse or existing materials, improvement of resource conservation, and use of local natural materials. We are educators that collaborate with some of the top permaculture activists in the world. We are growing, connecting and collaborating the network in the local area and throughout the world. We continue to educate ourselves by attending workshops, teaching workshops, and going to permaculture convergences. The project will offer education and improve and restore the culture to reconnect and remember our care for people, our fair share and earth care. We will provide experiences and retreats in the tropics to help people connect humans to their tribal roots and learning a simple life. 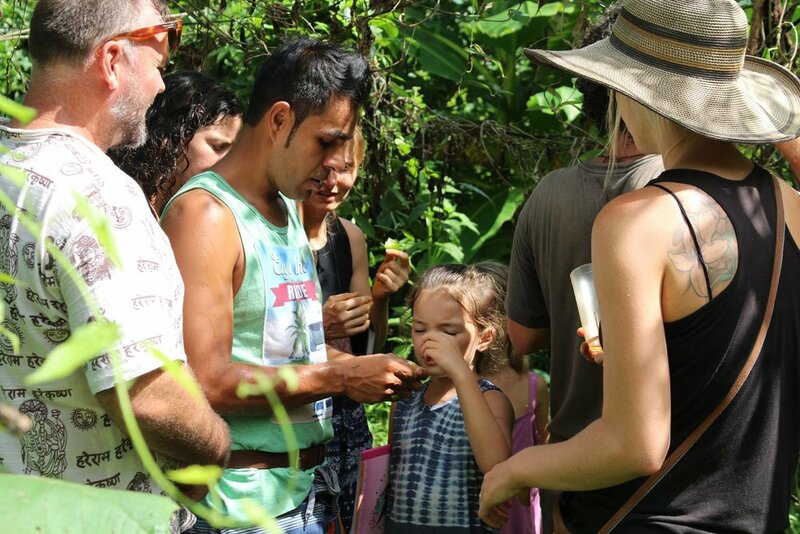 We are involved in collaborating cacao ceremonies and fire ceremonies within the community. We will create an online platform that has educational tools, and social awareness. Within the existing property we are creating a medicinal garden, an apothecary, a fermentation station, and an organic garden to grow our own medicine and food. This connection to our primary source of medicine and food is a spiritual practice. Also we have other spiritual practices that help use connect to our source and light within. A few examples are ceremonies, dance, yoga, fires, and meditation. The project will be involved in many of these practices that improve the health of the community. Our initial investment to the associate is $250,000 USD. (Review start up costs section for more details). This is for land, startup costs, tools, labor, and volunteer cost of living. The project will offer workshops, retreats and sell products from the farm at the local market. All this will generate other income to sustain the project. The purpose of the project is to improve the economy and financial situation of the community and also show other economic systems outside the conventional such as exchanging seeds, plants, and products with local farmers, friends, and community. The existing land is within the marti-time zone and we have the permission to use the land. In the future, lands for protection and regeneration these will be the associations.